Editors note: This is the first article in our new series on adult beverages to enjoy with your cigar. Each Stogie Spirits tip will examine a different cocktail or beverage. For an overview of drinks to enjoy with your cigar, read our Choose Your Booze tip. May first means not only has spring arrived, but warmer weather is here to stay. And it also means that the Kentucky Derby is just around the corner. The Derby is the opening race of the Triple Crown series, and an event with a drink all of its own: the Mint Julep. No matter how you make this delightful beverage, with all its mint and sugar it might not seem like a perfect match for a cigar. Yet with a plentiful amount of bourbon, the Julep is a great change of pace from the traditional bourbon – straight up or on the rocks. 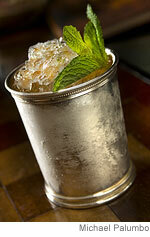 If you order a Julep at a bar, it is likely to made with Jim Beam. Early Times is the official bourbon (technically it’s a Kentucky whiskey) of the Kentucky Derby, but I would suggest springing for something better like Evan Williams Vintage Single Barrel. As for your stogie, pair the Julep with a mild- to medium-bodied smoke with just a little spice such as a Fuente Chateau Maduro, Romeo y Julieta Vintage III, or a Toraño Exodus. For the perfect Mint Julep experience, one should be at the horse track with a sawbuck on your horse to win. There’s nothing better than returning to the betting window with a Julep in one hand and a cigar in your mouth to collect you winnings. First, let me say I enjoy your website very much – I only recently stumbled across it and so far the articles, tips, etc have been interesting and fun! I need to remark on your mint julep article ONLY because, well, I'm a big bourbon fan! You mention that Early Times is the official bourbon of the Kentuck Derby. Actually, that's not true – unless something's changed in the past year, Woodford Reserve is the official bourbon. Not a bad choice, but for my money, I'd prefer ANY of the various vintages from Pappy Van Winkle, Basil Hayden's or the old standby – Maker's Mark. Thanks for letting me go on a kentucky spirits enfused rant! At the Kentucky Derby Web site, there's a page on mint julips (http://www.kentuckyderby.com/2007/derby_experience/mint_julep.html) — with a recipe, of course — and it notes that "The Early Times Mint Julep Ready-to-Serve Cocktail has been 'The Official Mint Julep of the Kentucky Derby' for over 18 years." Thanks for the comment, but I think you are mistaken about Woodford Reserve. According to the <a rel="nofollow" href="http://www.kentuckyderby.com/2007/derby_experience/mint_julep.html&quot; rel="nofollow">official Kentucky Derby website Early Times is the official mint julep the Derby, as it has been for "over 18 years." Still, you're probably better off drinking Woodford Reserve! To help clear up some of the confusion, at Churchill Downs you can have your Mint Julep prepared with either Early Times or Woodford Reserve (the only two bourbons sold at the Derby). Where it gets complicated is that you have to visit one of only a few special stands to get a Mint Julep made with Woodford Reserve (and you'll pay a premium price for it). All the other stands mix theirs with Early Times. That said, while I prefer Woodford Reserve…after the first few Juleps, it hardly makes a difference. The Julep looks and tastes pretty…but it's got some serious sting to it. And as it has been pointed out, despite the sweetness it's a great pairing with a cigar. In fact, on Derby Day you're as likely to see as many cigars in the stands as fancy hats. I prefer a Punch Chateau L Double Maduro or a spicy Avo. I'm growing some spearmint but unfortunately it isn't big enough to be used it. I was planning on making these and some mojitos.